CLICK HERE TO VIEW OPEN POSITIONS & APPLY TODAY! Want more from your job than just a paycheck? Consider working for a place with more benefits than you expect! 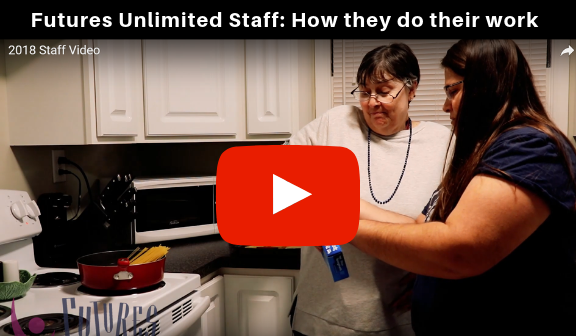 Our 120+ employees work in a variety of positions carrying forward the mission of Futures Unlimited, Inc.
We invite you to browse our open positions and apply online. Our job opportunities vary: some work in the office, some with preschoolers, some with children or adults with disabilities, and some behind a steering wheel. But one thing is the same: our staff feel they are having a positive impact in the lives of others -- and that feels good! Membership in the Kansas Public Employees Retirement System KPERS is automatic and mandatory on your first day of employment in a covered position. Covered positions are those scheduled to work 1000 hours or more per year. We love finding good employment matches - where YOU feel you are a good fit for Futures and WE feel you are a good fit for us! Are you a good fit for Futures? Watch the below video and find out! In an employee survey, 97% of employees responded that they were proud to work at Futures. Our employees find their work meaningful and valuable - and we feel our employees tell it best! Check out the short video below to see the work our employees perform every day. "Working at Futures was the most rewarding job I have ever had, and I have been working exclusively in fulfilling and rewarding fields for a decade now. It was an incredible, transformative experience I still talk about to this day. If anyone is looking for a position in a care-giver field, I cannot recommend the DSP job strongly enough." We invite you to consider a career at Futures Unlimited, Inc! Want to learn more about us? Visit our YouTube Channel to view more videos showcasing our amazing staff and the wonderful children and individuals we serve! Or visit us on Facebook!